Habitat: Tarragon originates from cetral Asia. Description: Perennial plant, grows to 150 centimeters tall. It has slender branched stems and long, lanceolate leaves. Leaves are dark to glossy green in color. Flowers are white, produced in dense, flat clusters. Parts used: The fresh or dried leaves and roots. Useful components: Coumarin, bitters, estragole, flavonoids, ocimene, tannins, terpenes. 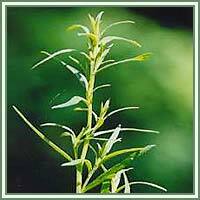 Medicinal use: Tarragon has been used medicinally since antiquity. 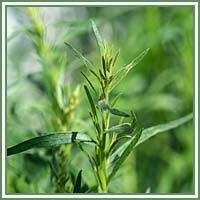 Traditionally, Tarragon has been used to treat tootaches, as a mild sedative, heart disease prevention aid and as an antidote for snakebites. Nowadays it is used in treatments of digestive complaints: it relieves stomach cramps, promotes appetite and production of bile. Tarragon is also used to promote menstruation, as a mild sedative and as a substitute for salt for people with high blood pressure. The root can ce used in cases of aching teeth.